But what if data conversion needs to happen on a mass scale? For instance, what if you need to convert all of your customer records into a different format so you can export them to a new CRM program? What’s our process for data conversion? Ideally, your company or organization should have a clearly laid out process for data conversion. This process should be written out in detail and easy to share between team members and stakeholders. Any queries created to aggregate and export data should be listed in a clear, easy-to-follow format. In addition to articulating what needs to be done, these data process documents should also list why each step needs to be taken. Your data conversion process documents should explain the importance of following the processes to a T, and leave no room for anyone to fill in the blanks. When you have clearly articulated processes that tell team members what to do and why, anyone who finds themselves in charge of data conversion has a clear, proven process to follow. Whenever someone leaves the company or goes on vacation, you can trust that the integrity of your data is protected. Have we backed up all of our data? 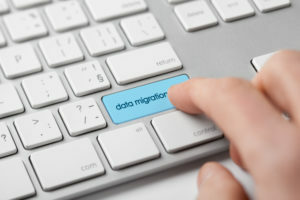 The first step in your data conversion process should be a backup of your data in its current format. Think of the backup process like walking a tightrope over a net – it’s the best way to ensure your data is safe and protected should something go wrong during the conversion. Which tools are we using for data conversion? Does your CRM software have a data conversion or export tool that you’ll be using? Are you going to use a third party application or company to help with data conversion? After all, even the most cutting-edge, technologically advanced tools are useless if you don’t know how to use them! Do we understand the downsides of the format we are converting to? In many data conversions, you’ll have to export data, convert it, then bring it back into your CRM program or other database. When data comes back to you, will it return in a format that you know how to bring in? Your new data may override or sit beside your old data – make sure you know where you want to put it before the data conversion begins. Do we have enough time to do this right the first time? Making mistakes always costs more time and money than doing it right the first time. That’s definitely the case for data conversion. If you don’t have time to do it right the first time, how will you ever find the time to go back and do it again when you’re in a hurry? Don’t succumb to the pressure of doing a rushed job on data conversion. Taking your time, planning ahead, and making sure you have all the necessary resources in place are all crucial steps to success. Do we understand this stuff well enough to do it ourselves? Whether you run a corporation or a nonprofit organization, it’s not a matter of if you’ll have to convert data – it’s when. It’s a good idea to plan your data conversion process before you have to do it. If you need help, feel unsure, or simply don’t have the time to do it right, your best option is to work with a third party that specializes in strategic data conversion. This recipe has such a startling presentation that I had to try it. It’s very tasty and adults enjoy it just as much as kids! I liked the flavors so much that I combined them all again – this time using penne pasta instead of spaghetti, and a large rectangular casserole dish instead of a pie pan. Spaghetti pie reminds me a lot of asking the right data conversion questions. Some of the most important questions to ask yourself about a data conversion – do we have enough time to do this right? Which tools should we use? – are the exact same questions to ask before baking your pie! With the right tools (ingredients), goals (deliciousness), and understanding (recipe), you can create a data conversion – er, spaghetti pie – that will make your brains fall out! Have you asked all the right data conversion questions? Massa & Company has the answers. Find out how we can streamline the data conversion process so you can get back to running your business.